Steven Soderbergh may be Hollywood’s worst retiree, but so long as the esteemed writer-director continues to dream up movie ideas in the vein of Logan Lucky, we’re more than happy to endure the ‘will he, won’t he?’ saga that often follows. Pitched as a NASCAR heist drama centering on two redneck brothers, Soderbergh’s latest is a truly all-star affair, with Channing Tatum and The Last Jedi‘s Adam Driver anchoring the on-screen shenanigans as brothers Jimmy (Tatum) and Clyde (Driver). Out of luck and out of money, the hapless siblings decide to put their heads together and formulate a get-rich-quick scheme, which just so happens to involve stealing a large sum of money from the world-famous Coca-Cola 600 race at Charlotte Motor Speedway. They won’t do so alone, either, and up above you’ll see the moment when the luckless Logans recruit Joe Bang, Daniel Craig’s wonderfully named explosives expert, to stage the so-called Hillbilly Heist. Cue the fireworks. Remember when we said Steven Soderbergh had tapped an all-star ensemble? 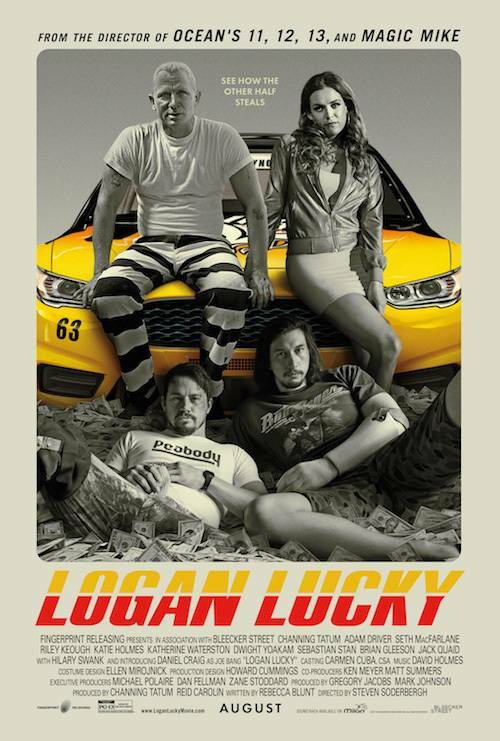 If the enviable trio of Tatum, Driver, and Craig wasn’t enough to reel you in, Logan Lucky‘s casting docket also features the likes of Seth MacFarlane, Katie Holmes, Katherine Waterson (Alien: Covenant), Dwight Yoakam, Sebastian Stan (Captain America: Civil War), Brian Gleeson, Jack Quaid and Hilary Swank. Jimmy Logan (Channing Tatum) is from a blue-collar family from the hills of West Virginia, whose clan has been famous for its bad luck for nearly 90 years. After being fired from his job, and with his ex-wife (Katie Holmes) threatening to move out of State taking their daughter with her, Jimmy decides he has to do something to get his family’s life back on track. With a little help from his brother Clyde Logan (Adam Driver), his sister Mellie (Riley Keough) and an incarcerated explosive expert, the aptly named Joe Bang (Daniel Craig), he plans to steal $14 million from the Charlotte Motor Speedway on the busiest race day of the year. Logan Lucky screeches into theatres on August 18th, a release date it currently shares with Ryan Reynolds and Samuel L. Jackson’s crime caper, The Hitman’s Bodyguard. Which film will emerge victorious at the box office? Time will tell.